Tere saath chale hain wasn't even on my list of Talat-Lata duets, but it's a song that has grown on me since I heard it for the first time a few weeks ago. Picturised on Nasir Khan, better known as Dilip Kumar's brother, and on Nargis, this is a mellow, romantic number - the sort of song that Talat Mahmood could probably sing in his sleep. Also, though the song itself is a 'soft' one, Lata is consistently hitting the high notes without it being apparent. Her control over the notes is that effortless, and Talat's deeper (and lower) 'voice' is a perfect complement to hers. I like this song as much for the musical interludes as I do for the melody itself. I had Do dil dhadak rahe hain aur awaaz ek hain from Insaaf on my short list, but decided to post this instead, because there is a contrast between the words as sung, and its picturisation. The juxtaposition of happiness (the girl is excited at going away to her husband's home) and sadness (a brother missing his sister who is separated from him) makes the pathos even deeper. The song was picturised on lyricist Shailendra who appears as the blind beggar, and on Baby Naaz who plays the little girl separated from her brother. (There is also another girl, seen in the screenshot above, on whom the first part of the song is picturised, who is uncredited.) Though the story is ostensibly about both siblings, it is Naaz who steals the show (she won a special mention at the Cannes Film Festival). She was around 6 or 7 when she acted in Boot Polish, and was a complete natural in front of the camera. It was perhaps one of the few films of the time (or even later) where children on screen remained normal children instead of precocious mini-adults. It's a cinch which songs come to mind when you think of a Talat Mahmood-Suraiya duet. Raahi matwale from Waris or this one. After Lata, I think it was the Talat-Suraiya combination that really called to your emotions - his soft-as-silk voice blends beautifully with Suraiya's husky vocals. It is they who make this film come alive, because while Sohrab Modi paid great attention to historic detail, the film could have done with a tauter script and tighter editing. But Modi assembled a stellar crew - Saadat Hasan Manto wrote the story, Rajinder Singh Bedi wrote the dialogues, while Ghulam Mohammed set Ghalib's poetry to music. This is one of my favourite ghazals of all time - telling a tale of two people who love each other but who cannot be together because of circumstances they cannot control. They spill their emotions out in verse, asking the most rhetorical question of all time - Dil-e-nadaan tujje hua kya hai? Of course they know what' s happened to their hearts. To me, Talat Mahmood and Geeta Dutt made a perfect combination; they had the same sort of voices - soft, slightly husky, full of pathos. Perhaps it is confirmation bias, since both singers have their fair share of angst-ridden songs. Perhaps that is also why I steered clear of their sad duets, of which there are plenty, to pick a lighter, romantic one. It is always a pleasure to hear Geeta Dutt, especially in her not-so-sad songs (Of which there are plenty, but she is boxed into the image of a serious, pathos-laden singer. ), and it is great to have Talat accompany her. Unfortunately, there is no video of this song available, so one merely guesses that it was picturised on the lead pair - Mahipal and Shakila. The other song that was on my short-list of their duets was the equally romantic Armaan bhare dil ki lagan (Jaan Pehchaan). The only reason this made the cut was because, right now, I like this song better than the other. An obscure film, but with such lovely songs, Mangu initially had Mohammed Shafi as the music director and he did compose one song in the movie. But OP Nayyar seems to have composed all the other songs. Mangu, according to IMDB, was produced by Sheikh Mukhtar and starred him, along with Sheila Ramani and Nigar Sultana. With no video to check, I have no idea who this song is picturised on - probably the second lead, since OP was the MD and Asha Bhosle is also among the singers listed in the credits. But it is a lovely song, nevertheless, and worth a mention. Another obscure film, another music director duo that I had never heard of, and a song that I first heard just a few weeks ago when I was researching Talat's solos. Yet, I have always liked Mubarak Begum's voice in the few songs that I've heard of hers, so this was perfect. Once again, I liked the song as much for its lilting romance as much as I did for the musical interludes. My other choice for a Talat-Mubarak Begum duet was the equally romantic Zara kehdo fizaaon se from the equally obscure Gogola (1966). I have never heard of this movie until I came across this song, and I have no idea what the title means, or what the film is about. The score is composed by another music director that I have never heard of - Roy Frank. Pyar ki Dastan is not an obscure film by any means, but the Ameeta-Sudesh Kumar starrer was not a box office success. And while music director Nashaad (born Shaukat Ali) is certainly not unheard of, he is not as well-known or popular as some of his peers. Lyricist Sarvar is certainly obscure, having (as far as I have gathered) written lyrics only for two songs. The lyrics of this song are pretty decent, so I wonder why he never made a career in the film industry. Suman Kalyanpur returns to singing under the baton of Nashad, who gave her her first break in Darwaza (1954). 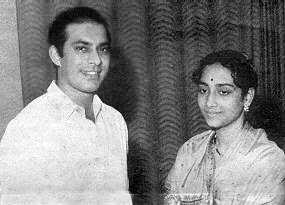 According to talatmahmood.net, Suman Kalyanpur sang her first ever duet with Talat Mahmood for that movie. Another beautiful melody from yet another another obscure film, Ek baar toh mil lo gale is picturised on Chitra (whom I recognise from a film that I recently watched) and Amarnath - neither name nor face ring any bells. One of the few 'sad' songs on this list, it sings of separation as the heroine (?) is led away to her death while the hero watches helplessly. Lyrics by Bharat Vyas (no relation to the music director) emphasise the impending separation and hopes for a meeting in the hereafter. My usual restriction for posts on duets is that it must not involve a third singer or even a chorus. I've broken my own rule for this song, primarily because I wanted to include this song, and partly because, as I mentioned earlier, there aren't that many choices when it comes to duets with different singers - none that I particularly like, anyway. Dil-e-Nadaan is Talat Mahmood's first ever appearance as hero in a Hindi film made in Bombay. His co-stars were Shyama, who made no secret of her admiration (and attraction) for her handsome hero, and Peace Kanwal, a debutante picked after a nation-wide talent/beauty search. While Talat sings for himself, Sudha Malhotra playbacks for Shyama, while Peace lip-syncs to Jagjit Kaur. The provenance of Love and God is interesting. A retelling of the age-old Kais-Laila (better known as Laila-Majnu), K Asif mounted the film with Guru Dutt and Nimmi in 1963. When Dutt's sudden death in 1964 threw a spanner into the works, Asif signed Sanjeev Kumar to replace Guru Dutt. Unfortunately, Asif died in 1971, and the film remained incomplete. Asif's assistant director, Mohammed Mehdi Rizvi, struggled to complete the film, and it was eventually released in 1986 - a year after its hero, Sanjeev Kumar had also passed away. Among other things, this song is important for one reason - other than Kishore Kumar, all the great male voices from the golden period seem to have come together for this song. (One clip even included Hemant Kumar as one of the singers. I'm not very sure of that, so I've left his name out.) Rahega jahan mein tera naam also segues into Mohammed Rafi's beautiful rendition of Tumhare dar tak. Beautiful. *If anyone is interested in just soaking in the songs, here is the playlist. Yay, first to post.. :-) Wow, nice list, Anu. And quite a few songs are new to me - especially, the ones from Badal aur bijli, Dil-e-nadaan, and Pyar ki dastaan. In a hurry now, but will check it out and rack my brain (and collection) if I can find any other old "new" song! Thanks! Other Talat duets that I can think of right now are: Armaan bhare dil ki lagan (Talat-Geeta from Jaan Pehchan), Mera Kahan Hai (Talat -Jikki from Gul-e-bakavali (? ), and Badi Mushkil hai tumhe bhool Jana (Talat- Sabita Bannerjee, Hum hain rahi pyar ke). okay, now I have to go! So Talat Mehmood continues..... I was wondering if you would post his duets with other singers besides Lata and my wish is granted. I have not listened to all of them yet, but so far I am enjoying everyone. Some, I have not heard in ages. Do dil dhadak Rahe hai aur awaaz ek hai. I like the melody a lot. As I was listening to the Geeta Dutt duet, this song showed up in the side bar. It sounded unfamiliar at first but as it played, I remembered it have not heard it since ages. You're welcome, Harini. And I'm glad you got to be first to comment - does that mean that the email subscription has begun to work again? Of the songs you posted, I like Laage tose nain and Bade mushkil hain. I mentioned Armaan bhare dil in my post - it was the second of my choices. Mera kahan hai is new to me - or at least I don't remember the song from the title. I'll have to listen to it, but right now it strikes no bells. Kaisi haseen hai raat was originally recorded as a Rafi-Talat duet. Unfortunately for Talat, Manoj Kumar insisted on having Mahendra Kapoor sing for him. Naushad had to give way, and it is the Rafi - Mahendra Kapoor version that is heard in the film. The Talat version is available only in audio format. It was really the beginning of the end for Talat Mahmood. Thank you so much for the appreciation, Neeru. :) I'm glad you enjoyed the songs. Do dil dhadak rahe hain was very much on my mind; in fact, I'd mentioned it as my second choice for an Asha-Talat duet. I didn't know Ae gham-e-dil kya karoon was also a duet. I thought it was a solo with two versions, one by Talat and one by Asha. Thank you for this link. I'm listening to it while responding to you. I am always slightly taken aback when I see Premnath singing on screen. :) But again, lovely song, lovely heroine. What a lovely song this is! Had never heard this before... and wow, Shakila - so pretty as ever. Thanks, Madhu. Aah, thanks for confirming. I figured this was the story - Mahendra Kapoor dubbing for Talat in the final version. But was not sure. I second Anu's motion - you should totally do a Talat-Asha duets post, Madhu! :-) I rather surprised myself by mostly coming up with his duets with Asha when I thought of Talat duets I like. :-) They have a fair and varied quantity of songs together. But before I get to my favorites of their songs, let me mention some of his songs with others that I love. Talat-Suman - The "Pyaar Ki Dastaan" song is lovely, but I'm partial to their duet from Darwaza - Ek dil do hain talabgar. Talat-Geeta - Again, love your pick but here's a cute number from Makhichoos. Last 5 ( except for the Jagjit Kaur ) are new to me. I liked the Mubarak Begam duet the best out of the new ones I got introduced to. Oh. :( I was hoping my blog had gone back to behaving itself. Ah, well, thank you doubly for checking in to see if I've posted anything. Gosh! I'd much rather listen to the song than 'see' it. Perhaps it was a dubbed film? It looks southie to me. You always come up with some songs that I haven't even heard before, Shalini. I can't listen to then right now (the TV is on), but I will soon. I totally agree, Anu. When I am playing some song, I see some other which looks unfamiliar but when played turns out to be an old favourite not heard in ages. I have made it my life's mission -- well, one of my life's missions -- to listen to as many old and forgotten songs as I can and time is a-fleeting! I am so so happy to see the first song. I simply can't have enough of this one. The song is so effortlessly sung by both Talat and Lata and it is so soothing. Even I like the Lala Rukh duet Pyas kuch aur...of Asha and Talat. I would have liked to add the Asha-Talat Dil-e-nadan zamane mein...from Mast Kalandar by Hansraj Behl. And for Suman-Talat, I would have loved Ek dil do hai talabgar badi mushkil hai....from Darwaaza. The Shamshad-Talat duet you have posted is new to me, though I have heard other songs from the film. But I was so disappointed not to see Talat-Madhubala Zhaveri featured here. They have sung so many lovely duets mo how to st of them tuned by Hansraj Behl. My most favourite ones are both from Dost -- Ae zamane bata and Jab se maine dil lagaya. Seeing you make playlists, I am wondering if I should make them too, only I have to yet learn how to do it. The video is from a south indian film, same name starring MGR. Apparently this story (loosely based on ‘One Thousand Nights and One Night' (‘Alf Leila Wah Leila'). has been made into a movie in India several times in various languages. The Tamil one released in 1956. While the hindi one was made in 1963. No worries. My mouse jumps all over the place too - he's quite drunk sometimes. I've corrected it. Ah, yes, I thought he looked familiar. Thanks for the info. I shall have to give serious thought to the idea of that post. Shalini has posted some songs I'd never even heard of, let alone heard - so listening to all of those is top priority for me now. You are in a Talat mood and I for one am not complaining. I actually like the combination of Talat with Suraiya and Geeta Dutt even better than the Talat - Lata one. I feel their voices go really well together. Most of the others were rather new but good. So thanks. One more, but then again I seem to favor Asha too. Sach bata, tu mujh pe fida from "Sone ki Chidiya". Thanks Shalini for posting "dil jawan hai aarzoo jawaan",. I have been trying to remember this song while posting a couple of songs. I was going through my cassettes to try and remember. Shalini always posts song that I've never heard of, let alone heard. :) :) I have her to thank for introducing me to some really wonderful melodies! In a 'Talat mood' because I just couldn't make up my mind. :) I'm glad you are enjoying it, though. I like that song too, Neeru. Thanks for the link. That is a nice song, Neeru. This is the place I come to, to educate myself. I have been lapping up the last few posts but because I hardly have anything to add, I refrain from commenting . I'm addicted to COC and Dustedoff. Both of you are marvellous. Loving music and films is something which is very abstract and vague, but blogs like this give it a voice and a shape. It renders an intangible love with a lot more meaning. And all the critiquing of films and music comes from a place of love. I always admire people who can care about something and still look at it with questions. As for this post, the only song I recognised (and love) is Dil e nadaan from Mirza Ghalib. That film has exceedingly beautiful songs and Ghulam Mohommad's score for this and Pakeezah and right up there on my list of 'oncredible film score . Each song has a story of its own. Not to mention that the lyrics are sublime. Anyway I first encountered Talat Mehmood when I followed an enchantingly beautiful song into a not so wonderful film. I listened to the song 'Tum to dil ke taar ched kar' and watched the film 'Roop ki rani, Choro ka raja' from beginning to end. Parts of it were interesting. Music was not bad. But the end was strangely put together, as if just for the sake of it. Still, Dev and Waheeda, this song and its picturization was magical. I first started listening to film music when I was sixteen, and Talat Mehmood's voice sounded a lot like Hemant Kumar's. Now, two years later, I can finally tell them apart. Thank you for the post. Great read, as always. Also sorry for the typos, disqus us eating some of the alphabets. Roop ki Rani, Choron ka Raja belied its wonderful cast. There are so many films that have wonderful songs but are not worth watching that I sometimes think it would be a public service to write a post warning people away from them. Eh, don't worry. Disqus is a pain sometimes. Talat Mahmod continues, daur chalta hi rahe . Rahi matwale takes me to the other plane. Haan, daur chalta raha. :) Thanks for those additions as well. Both such lovely songs.